The combination of a car-friendly culture and popular sedentary activities like watching TV or playing video games make it unsurprising that at least 25 per cent of Canadians between the ages of two and 17 are overweight, according to Statistics Canada. Students at Piedmont Elementary eat lunch at school Tuesday, May 1, 2007, in Charleston, W.Va. 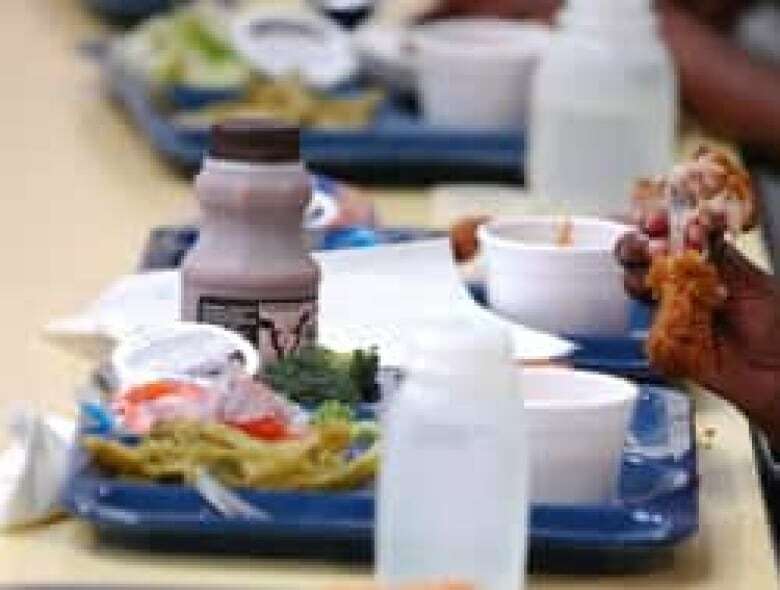 Many school administrators are sneaking nutrition into school lunches, in an effort to combat the nation's growing childhood obesity problem. Administrators are cutting fat and calories by supplementing hamburgers with soy and subbing applesauce for shortening in cake. ((Jeff Gentner/Associated Press))Some Canadians may be haunted by memories of being whipped by dodge balls in elementary school, not being fit enough to play midfield in soccer or watching as all your classmates were picked ahead of you for whatever game was the focus of this week's gym class. Unpleasant memories of phys-ed can turn Canadians of all ages off exercise and sport. A few years ago, the Canadian Medical Association Journal reported that the average Canadian kid spends three to five hours a day sitting in front of a TV or computer screen. The study also showed that in the past 15 years, the incidence of obesity has grown by more than 50 per cent in children age 6 to 11 and by 40 per cent in those between the ages of 12 and 17. Adding to the problem is that only nine per cent of parents acknowledge weight problems in their children, the Canadian Medical Association reported in August 2006. Canada's Physical Activity Guide advises children to aim for 90 minutes a day of physical activity. Increase the time currently spent on physical activity by a total of at least 30 minutes more per day. Reduce "non-active" time spent on TV, video, computer games and the internet, starting with at least 30 minutes less per day. The 30 minutes more of physical activity can be accumulated in bouts as short as 5 or 10 minutes. In 2002, researchers in Nova Scotia concluded two-thirds of children and youth in Canada aren't physically active enough to gain health benefits that would offer protection from heart disease and Type 2 diabetes. The researchers fitted children with pedometers that recorded all of their physical activity - club and recreational sports, walking etc., rather than relying on children to report how much they moved. Over the past two decades, rates of overweight and obesity nearly tripled among Canadian children, according to the Canadian Institutes of Health Information's report, titled "Improving the Health of Canadians 2004." Likewise, the report's authors noted four out of five Canadian youth are not active enough to meet international guidelines for optimal growth and development. The Active Healthy Kids Canada 2009 Report Card found that only 13 per cent of the country's children and youth were getting 90 minutes of physical activity a day. The organization says besides the health benefits of physical activity, its research shows that active kids do better in school than sedentary kids. The federal government has touted its children's fitness tax credit as one way to encourage parents to help their kids get active. Parents can claim a maximum of $500 a year for eligible fitness expenses. Eligible activities must "include a significant amount of physical activity that contributes to cardio-respiratory endurance, plus one or more of: muscular strength, muscular endurance, flexibility or balance." Joe MacDonald, a professor at the school of education at St. Francis Xavier University in Antigonish, N.S., would prefer to see funding for school sports teams connected to the school curriculum. If young children are taught to understand how their bodies move, they'll be more likely to join the teams, he told CBCNews.ca. Instead of being intimidated, they'll learn to enjoy sports and physical activities. Endocrinologist Dr. Laurent Legault of Montreal Children's Hospital agrees self-consciousness and low self-esteem can be barriers to phys-ed instruction. "We want to move past the team sports concept and move to activities that someone can take with them when they're 80," Legault said. Teaching outdoor activities like cross-country skiing, for example, can be a hit with students. Before they can get to that stage, though, children need some tools. MacDonald called today's children "physically illiterate" — just as they need to learn the mechanics of grammar to read and write, they also need to learn the "language of movement." Students in primary grades need a foundation of quality phys-ed classes taught by phys-ed specialists, just as teachers specialize in teaching math or science, he said. Children who are overweight at an early age have a higher risk of developing chronic disease as an adult such as diabetes, cardiovascular disease and high blood pressure. Studies have shown that overweight children are more likely to become overweight adults. Lesson plans should teach gross and fine motor skills, spatial awareness and timing. It may seem like children can run instinctively, but according to MacDonald, they need to learn the pacing of running. Teaching children how to do three simple activities — run, jump and throw — is the key to their being able to enjoy other physical activities, from dance to golf to hockey. Under this strategy, by the time children are about 11, they'll have the proper psychomotor development and skills needed to play sports, he said. Instead, adults impose their rules on children, forcing them to play sports by adult rules. Under that formula, only the elite kids who can handle it are able to succeed at sports, the professor said. He cites Canada's Kyle Shewfelt, Olympic gold medallist in gymnastics, as an example of the one-third of Canadians who were physically active as a child. At age six, before starting school, Shewfelt was asked by a coach where he learned to do a handspring. "In the backyard," Shewfelt answered. Parents, teachers and coaches nurtured the naturally gifted athlete to success at the Olympic floor event. The CIHI report notes physical activity among children and youth is often linked to school settings. Daily phys-ed is required until graduation in Quebec. Alberta requires 30 minutes of physical activity in all schools from grades one through nine. In Ontario in 2006, researchers recommended the province consider changing its high school phys-ed program to help adolescents get their recommended 60 minutes of moderate to vigorous physical activity. However, mandatory phys-ed classes until high school graduation might not be the ticket to reversing the childhood obesity trend. A study published in the March 31, 2009, edition of the Canadian Medical Association Journal found that while phys-ed does offer numerous health benefits, improving body mass index (BMI) in children was not one of them. "Although the physical activity interventions in the studies we analyzed were not successful in improving BMI, the underlying reasons for failure were unclear," wrote Dr. Kevin Harris of B.C. Children's Hospital, one of the authors of the study. But the researchers said there were other significant health benefits, including reduced blood pressure; increased lean muscle mass, bone mineral density and aerobic capacity; and improved flexibility. Provision of healthy meals in schools. Subsidies on fruits and vegetables for schools and daycares. "Recent evidence suggesting that the obesity prevalence rates in France plateaued following a range of multi-level interventions provides a glimmer of hope for other countries," she states. Those interventions in France included a study that enlisted most of the population of the towns of Fleurbaix and Laventie. Beginning in 1992, children received significantly more nutritional education, with a focus on traditional French fare. As well, children were encouraged to get involved in sports. The researchers found that as children's knowledge of nutrition increased, the eating habits of the entire family changed, putting a dent in rising rates of obesity. Increasing physical activity through unstructured activity and access to play equipment. Parents acting as role models of an active lifestyle for their children. Limiting television and computer time to less than two hours per day to reduce a child's sedentary time. Changing a whole family's lifestyle.